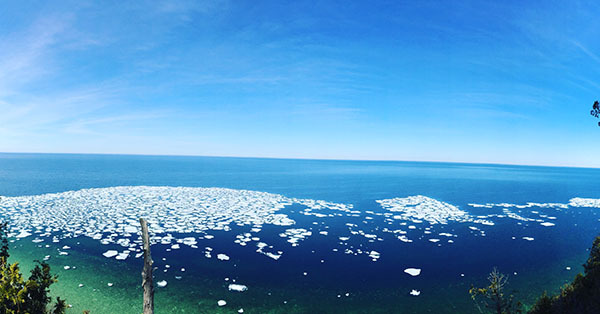 Ice breaks up near the shore of Door Bluff Headlands County Park in April of 2018. Photo by Myles Dannhausen Jr.
Near the northernmost reaches of the peninsula, one of Door County’s most underrated natural areas conceals its secret vistas from most visitors. The 156 acres of Door Bluff Headlands County Park stands undeveloped, and largely undisturbed, but adventurers should get to know this hidden gem. A winding gravel road gets you into the heart of the park, managed by the Door County Parks Department, and that’s about all. There are no bathrooms, grills or facilities here, and little in the way of trail signage. Just wilderness, towering bluffs and 6,800 feet of Green Bay shoreline. Good hiking boots or crampons are recommended for a hike on the winter trails at Door Bluff Headlands. Photo by Myles Dannhausen Jr. The one time it becomes a popular destination is in spring, when the ice shoves crumble upon its shores, sending photographers scrambling for a perfect sun-splashed shot. 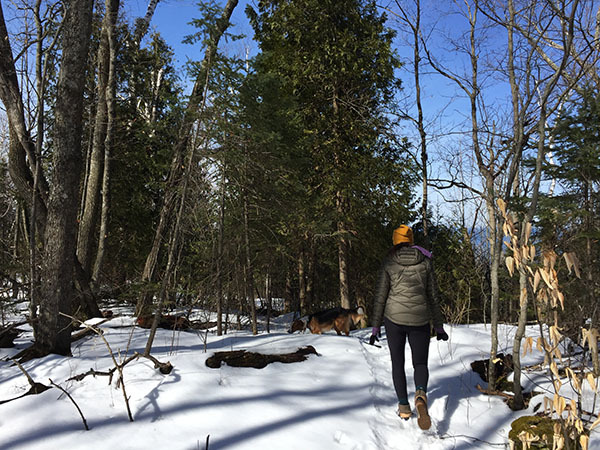 But these primitive trails offer a challenging winter hike through whitewashed forest with a payoff of stunning views of Green Bay and Hedgehog Harbor. 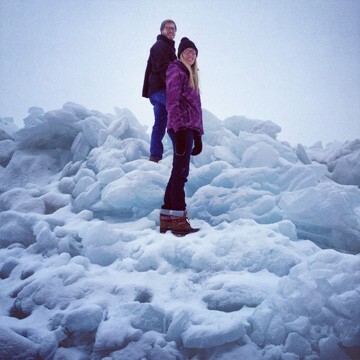 Tracy Slattery and Justin Ellingstad (carefully) climb the ice shoves at Door Bluff Headlands County Park near Ellison Bay. Photo by Sally Slattery. Difficulty: Hard (in winter). The trail is not cleared, and many areas can be icy and slick. Hike with extreme caution any time of year. Key Feature: The lookout from atop the bluff provides a beautiful panoramic view of the ice-covered bay. Fun Fact: Legend has it that Door Bluff Headlands are where the Washington Island Indians, the Potawatomi, fought the mainland Indians, the Winnebago. In the midst of the battle the weather turned and the rough waters and ensuing battle claimed hundreds of warriors, giving rise to the name Ports des Mortes, or Death’s Door. If You Go: Wear good hiking boots and crampons for grip, and use a walking stick. Trails aren’t marked, so a map or cellphone is recommended as well. Myles Dannhausen Jr. was born and raised in Egg Harbor and now lives in Sister Bay.